Please visit us at www.MoisanAuctions.com for more information on this & other upcoming events. 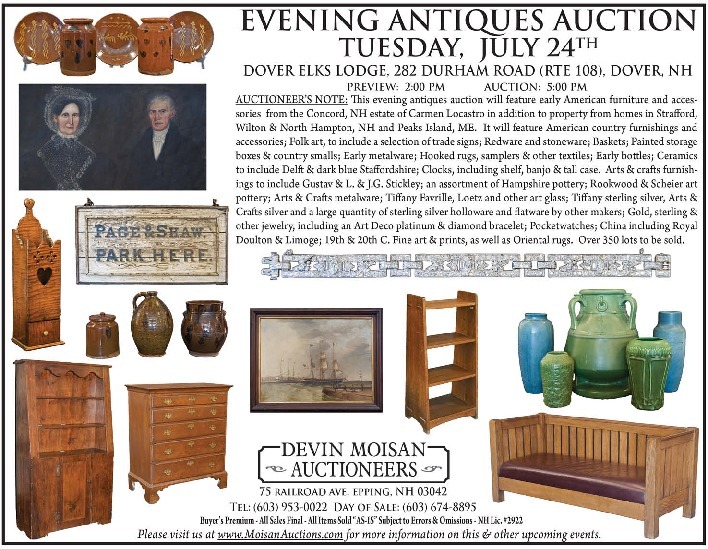 AUCTIONEER’S NOTE: This evening antiques auction will feature early American furniture and accessories from the Concord, NH estate of Carmen Locastro in addition to property from homes in Strafford, Wilton & North Hampton, NH and Peaks Island, ME. 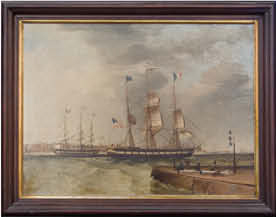 It will feature American country furnishings and accessories; Folk art, to include a selection of trade signs; Redware and stoneware; Baskets; Painted storage boxes & country smalls; Early metalware; Hooked rugs, samplers & other textiles; Early bottles; Ceramics to include Delft & dark blue Staffordshire; Clocks, including shelf, banjo & tall case. Arts & crafts furnishings to include Gustav & L. & J.G. Stickley; an assortment of Hampshire pottery; Rookwood & Scheier art pottery; Arts & Crafts metalware; Tiffany Favrille, Loetz and other art glass; Tiffany sterling silver, Arts & Crafts silver and a large quantity of sterling silver holloware and flatware by other makers; Gold, sterling & other jewelry, including an Art Deco platinum & diamond bracelet; Pocketwatches; China including Royal Doulton & Limoges; 19th & 20th C. Fine art & prints, as well as Oriental rugs. Over 350 lots to be sold.